North Korea Says Detained American Had Intended To 'Subvert The Country' : The Two-Way Tony Kim, an accounting instructor in his 50s, was detained at Pyongyang's airport in April. At least two other Americans are known to be held in North Korea, sentenced to prison and hard labor. Last month, North Korean authorities detained Tony Kim, an American accounting instructor, at Pyongyang's airport. 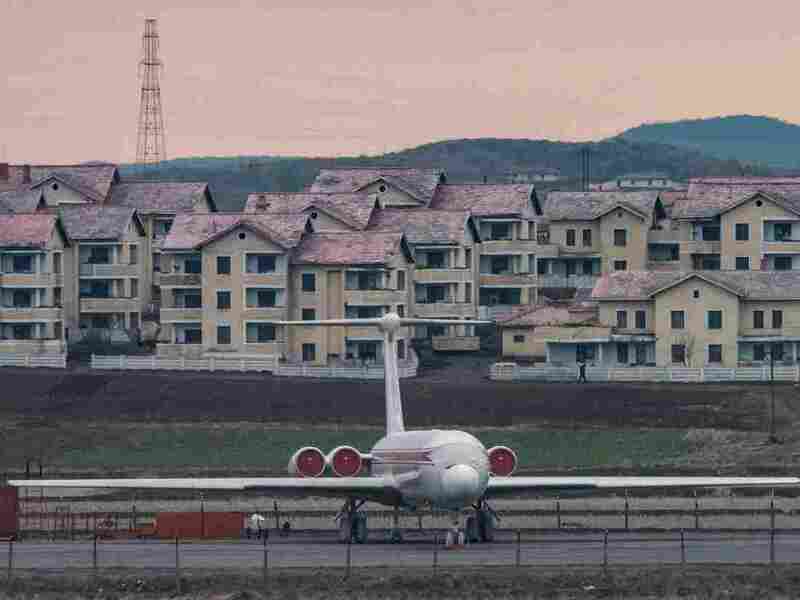 Above, a plane sits at the Pyongyang airport on April 17. In late April, a university in Pyongyang said the North Korean government had detained one of its adjunct professors, a 50-something American who taught accounting. On Wednesday, North Korea confirmed through the official Korean Central News Agency that it had indeed detained Tony Kim, and was holding him for "hostile criminal acts with an aim to subvert the country." As NPR's Anthony Kuhn has reported, Kim, who also goes by Kim Sang-duk, was held at the airport in Pyongyang as he was about to leave the country. "In the past, Pyongyang has demanded that Washington send high-level envoys to obtain the release of U.S. citizens detained in North Korea," Anthony reported. "For example, North Korea freed three U.S. citizens during visits by former Presidents Bill Clinton and Jimmy Carter in 2009 and 2010, respectively." But Zhang Liangui, a North Korea expert at the Central Party School in Beijing, told Anthony that there might be different motivations for Kim's detention. "North Korea has already clearly stated that it's not interested in a dialogue with the U.S. So they're not necessarily detaining this man for the sake of a dialogue," he said. The university where Kim had been teaching, Pyongyang University of Science and Technology, told Reuters that Kim's wife, who was with him when he was detained, had returned to the United States. The university also said it did not believe Kim's detention was related to his work at the school. The chancellor said Kim, who had previously taught at an affiliated institute in China, had also been involved in helping an orphanage. The United States has no formal diplomatic relations with North Korea, and tensions have been high recently between the two nations. Kim is the third American citizen known to be held in North Korea. Two others are serving prison terms with hard labor, for alleged anti-state actions and espionage. In March 2016, Otto Warmbier, a 21-year-old University of Virginia student, was sentenced to 15 years in prison and hard labor after a one-hour trial; his apparent offense was attempting to steal a propaganda poster. As we reported, "On camera, Warmbier said he stole the propaganda poster on behalf of a member of the Friendship United Methodist Church in Wyoming, Ohio, who wanted it 'as a trophy.' In exchange, he would receive a used car worth $10,000." A Korean-American man, 62-year-old Kim Dong-chul of Fairfax, Va., was sentenced to 10 years in prison and hard labor in April 2016; he was convicted on espionage charges. "Another captive, Kenneth Bae, an American missionary, said in his memoir 'Not Forgotten,' published after his release in 2016, that he was interrogated 15 hours a day 'from 8 in the morning until 10 or 11 o'clock at night, every day for four weeks — it was very intense.' "